He's been experimenting with all sorts of different styles in recent months. 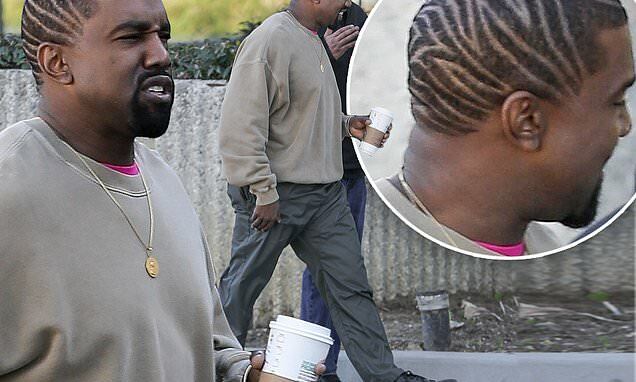 Now Kanye West has decided to shave off his dyed locks, in favor of a buzzcut featuring freestyle lines. The fashion-focused rapper showed off his new cut as he headed out in Calabasas on Thursday morning. After picking up a coffee with a friend, the two chatted as they walked along, side by side. Rapper turned fashion designer Kanye has been experimenting with his look in recent months. Normally a fan of a plain unadorned buzz cut, he has grown out his hair slightly and dyed it a variety of colors, from bright pink to grey and then white. Now it seems he's ready for something new, debuting his new look.